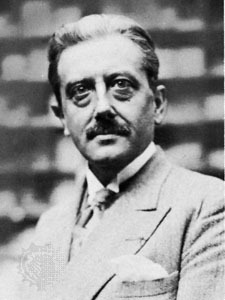 "No-I'm not an 'author'," declares Georges Bernanos. "Had I been a real one, I never should have waited till I was forty before I published my first book." It was in 19~6 that this book, Sous Le Soleil De Satan appeared, bringing him sudden celebrity as a writer and a psychologist. Several literary juries considered it for a prize, but it failed to obtain a majority anywhere. The author was working as an inspector for an insurance company at the time. "I began to write," he says, "to try to escape from this disgusting era." His first prize came in December 1929 when he received the Prix Femina-La Vie Heureuse for La Joie the sequel to L'lmposture. The Grand Prix du Roman of the French Academy was given to him in 1936 for Le Journal d'un cure de Campagne. This is perhaps his best known work; it has been translated into five languages. Father C. C. Martindale, S.J., said of it: "This book, then, by a layman, has been as good as a retreat for at least one priest. We hope it will be read in America. But an effort will have to be made by the reader. If he be comfortable, he must remember that the author who was (we understand) brought up in no such comfortable circumstances, sees vividly what we, from our padded chairs, can hardly imagine." Bernanos was born in Paris on February 20, 1888. He spent, however, the best days of his childhood and youth in an old estate in the country belonging to his father in the little village of Fressin (Pas de Calais), in a countryside of great woods and pasture land, which he has since made more or less the setting for nearly all the characters of his novels. His family came originally from Spain, but long ago struck root in several French provinces. He is profoundly French and attached to all that is ancient and great in France. His mother came from Berry. His teachers were the Jesuits at Vaugirard College, where he was, by the way, a schoolmate of General de Gaulle. His other schools were the Institut Catholique and the University of Paris. He received a licentiate in law and licentiate in letters from the University of Paris. In World War I he served as a corporal in the French Cavalry, and received a chest wound. The Croix de Guerre is his decoration. Married in 1917, the Bernanos have three sons and three daughters; the eldest son went to England in 1941, serving there in the Air Force; but he came back to Brazil very ill. His second son left in 1942 and was in the navy on a submarine chaser. His youngest son is only twelve years old (1947). His wife's family Du Lys d'Arc claims kindred with Joan of Arc. This saint is for the author a symbol of France. Bernanos is a Royalist, and was "discovered" by Leon Daudet, the director of L'Action Francaise. In 1936 Bernanos was living at Palma in the Balaeric Islands. His experiences of the Spanish Revolution at this spot impelled him to write les Grandes Cimetieres Sous la Lune (Diary of My Times). This fiery book provoked much discussion inasmuch as he attacked the Catholics for favoring Franco in the Spanish Civil War of 1937-1939. "The Spanish experience," he writes, "is probably the principal event of my life." In 1937 he returned to France, to Toulon, where he fell ill. The next year he and his family moved first to Paraguay and then to Brazil. They ren odelled a farm on the rolling uplands of Minas Geraes province, "far from the railroad and the highway with no other company than that of our horses and cows." It was there he wrote Nous Autres Fran~cais and Scandale de la Verite. When France capitulated Bernanos came nearer to civilization. His little farm was quite solitary but communication was more available. He became popular in the country and a friend of Foreign Minister Aranha. In 1946 he returned to France. He is a stout, heavyshouldered man with grey hair and mustache. He walks with two canes, and limps badly from an old motorcycle accident. An old cavalryman, he is happiest on horseback. Bernanos is known for his electrifying portrayal of evil, and the struggle of the soul with it. His vivid picture of the devil makes his ideas incomprehensible to much of the modern world. He once told an interviewer, "I have seen the devil, as I see you, since my childhood." He is a propagandist in his writings and says, "I humbly endure the shame ot having so far only spattered with ink the face of injustice, whose incessant outrages are my zest for life." He writes, "If I wanted to tell my friends in a few words the essential thing of which my religious and moral education consisted, I should say that I have been brought up with not only respect and love but also with the most liberal understanding possible of the past of both my country and my religion." The author is grateful to his pen for having enabled him to support his "numerous" children in some comfort, but he finds writing hard work. "I am no author. The sight alone of a blank sheet wearies my spirit, and the sheer physical isolation imposed by such work is so.distasteful to me that I avoid it as much as I can. I sit scribbling in cafes, at the risk of being taken for a drunkard-and that no doubt is what I should really be, if our mighty government did not burden so ruthlessly with taxation the cup that cheers. I write at cafe tables because I cannot long be deprived of the human face and voice, which I have tried to render with dignity. Let clever folk suppose that I sit 'observing' my fellow men. I observe nothing. Observations never lead to much. I scribble in cafes, just as I used to scribble in-railway carriages." He has travelled far since the days when as an insurance inspector he was forced to fit in his writing as he made his tours by train from his modest home in Bar-le Duc. His railway scribblings, however, rocketed him to fame. Bernanos was able to write regularly for the Brazilian press and for a few underground French magazines. Time magazine in its October 14, 1946, issue states: "Georges Bernanos is France's most distinguished Catholic author-and his own Church's sharpest critic." In an interview with the Most Reverend Edwin V. O'Hara, Bernanos explained his severe attacks on Catholics as an attempt to awaken Catholics to their responsibilities. He is the author of: Sous le Soleil de Satan (Star of Satan) (1926); Saint Dominique (1927); L'lmposture (1927); La Joie (1928); Jeanne D'Arc (1929); La Grande peur des Bien-Pensants (1932); Un Crime (a Crime) (1935); Journal d'un Cure de Campagne (Diary of a Country Priest) (1936); Nouvelle Histoire de Mouchette (1937); Les Grands Cimetieres sous la Lune (Diary of My Times) (1938); Scandale de la Verite (1938); Nous autres Francais (1939); Lettre aux Anglais (Letter to the English) (1942); Monsieur Ouine (1943); Le Chemin de la Croix-des-Ames (1943 and 1944), and The Open Mind (1945), translated by Geoffrey Dunlop. Originally published in St. Mary's Abbey's Catholic Authors, c. 1948.